APOLLO® Environmental Strategies, Inc. is a Texas corporation established to meet the diverse environmental needs of industry and government throughout the United States. 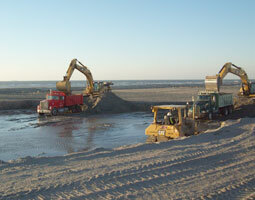 For over two decades, APOLLO® has offered a diverse assimilation of environmental and coastal construction expertise as well as a variety of state-of-the-art technologies for site assessment, remediation and dredging. Our staff is highly field-oriented so you can count on them being there to see to it that each phase of the project is completed properly and successfully. From simple, one-time site assessments to large multi-phase, highly complex remediation and development projects, APOLLO® stands prepared and experienced to meet your needs. APOLLO® serves the continental United States with corporate facilities located in Beaumont, Texas and with virtual offices and personnel in Dallas/Fort Worth, Corpus Christi and Houston/Galveston. © 2007-2011 APOLLO ® Environmental Strategies, Inc.